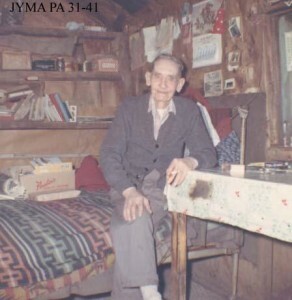 James Shand Harvey (1880–1968) spent decades as a guide and packer in the area around the Yellowhead Pass. Harvey was born in Scotland, the son of a wealthy family who owned the Castle Semple estate in Lochwinnoch, Renfrewshire. He left behind his life of privilege and wealth and emigrated to Canada, arriving in Edmonton in 1905. After a brief stint at homesteading, he worked on surveys for the Grand Trunk Pacific Railway, and for the Dominion Land Survey on the 14th base line from Lac Ste. Anne to Jasper. In 1909, he guided Arnold Mumm’s mountaineering expedition from Wolf Creek to their rendezvous with John Yates, and accompanied the expedition to Mount Robson. By 1911, with a few horses of his own, he hauled supplies from Lac Ste. Anne to Tête Jaune Cache. He was assistant packer to Donald “Curly” Phillips on the 1911 expedition to the Mount Robson region sponsored by the Alpine Club of Canada and the Smithsonian Institute of Washington, D.C. In the winter of 1917, Shand Harvey accompanied Phillips and Mary Jobe on their trip to the Wapiti. Shand Harvey later became a forest ranger and fire warden in the Grande Cache district of Alberta. In 1921 he built a cabin near Entrance, at the east boundary of Jasper National Park, and trapped in the surrounding hills. James MacGregor’s book Pack Saddles to Tête Jaune Cache is about Shand Harvey.